Might as well get it over with: Main Line Riders sounds like Bon Scott-era AC/DC. With new vocalist Shawn Edward Browning (Grave Robber, The Migraines), who looks like a lightweight Uncle Fester with a large bandana and a slender cross, the comparisons are inevitable. However, his vocals can be clumsy at times, slurring like Scott with a lisp (or too much liqour). But it's not the vocals alone. Every song sounds more like AC/DC from vocals to rhythm section to the guitar solos than the Main Line Riders own brand of melodic hard rock. Sometimes, the material is so similar, so near a total rip off, as on Through With You, Broken Hearted, or Worldshaker that AC/DC, if they wanted to, could sue for plagiarism and probably win. Unfortunately, all this near hagiographic musical tribute dissolves into an ominous redundancy. 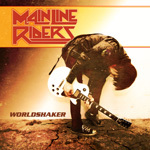 With few exceptions, there is so little variation on Worldshaker: basically, you know what is going to happen from one song to the next, and you're generally not surprised. Yet to their credit, Main Line Riders do all this very well throughout Worldshaker, and sometimes inspire as on the rock ballad Comin Home, the fine rockers Broken Hearted and Power Surge, or the earthy blues of Rhythm N Blues. Other times, the imitation is simply tedium as on Throwin Bones To The Wolves or the unnecessarily preachy We Are The Ready Ones. Main Line Riders are not necessarily going to set the hard rock world on fire as another AC/DC clone. If imitation is a fine form of flattery, the Riders have disc full of it on Worldshaker from cover art to content.